It has been a while since I’ve blogged one of my book reviews. I guess that is part of the parenting manual that I didn’t read: hobbies are no longer priorities. There have been plenty of good books pass before my eyes since my last review, but I felt content just to let a short sentence, a star rating and an update to my Twitter feed to promote a good read. This is slightly different. Ben’s book made me annoyed. I’m a science nerd. I prefer to read the original research papers rather than the media coverage of them, as it is always terrible, usually based on a half-arsed press release and never links to the actual research. I am constantly amazed that in our modern age of computers, internet, vaccines, satellites and zero calorie drinks that people still believe in stuff that wasn’t plausible 200 years ago. And that’s why Ben’s book annoyed me. He made it painfully obvious how deliberate some of the misinformation campaigns have been. I knew homoeopathy was rubbish (magic water droplets on sugar pills, or as I prefer to call it, a placebo), I knew that complimentary medicine is the term for stuff that hasn’t ever been proven to work, I knew anti-vaccine campaigners clearly didn’t remember that my dad’s generation had polio victims everywhere, I knew that “Big Pharma” are a mixed bag of good and bad science. So if I knew all of this already, why am I annoyed? Because I didn’t realise just how culpable the news media were and how media liaison and PR companies are straight up lying to people. You see, I always thought, and this is still mostly true, that most media get science wrong because they don’t understand it and it isn’t easy to do the background research to check a press release on a study. I see this as not having the specialist science reporters doing the science journalism (imagine if a science journalist reported on climate change from the beginning, we’d have emissions at zero by now). 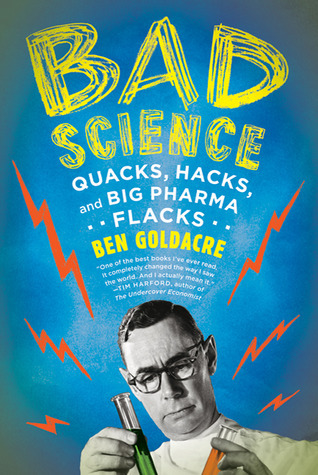 But with Ben’s section on the MMR “controversy” and the “nutritionists” in the media, he paints a very clear picture of culpability that the media needs to address, or as Ben points out, people will just go to science blogs written by actual scientists in that field. Excellent book and a must read for anyone who still reads newspapers or watches the TV news. PS: Yes, I’m also guilty of not publishing results, like most scientists I know. I make no excuses, I’m a terrible person.